Check out the latest SprezzaBox Spoiler on My Subscription Addiction! SprezzaBox August 2018 Spoiler + 25% Off Your First Box! SprezzaBox July 2018 FULL Spoilers + First Box for $10! SprezzaBox July 2018 Spoiler + 20% Off Your First Box! SprezzaBox June 2018 FULL Spoilers + 30% Off Your First Box! SprezzaBox June 2018 Spoiler + 30% Off Your First Box! 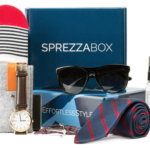 SprezzaBox May 2018 FULL Spoilers + Free Bonus Box Coupon! SprezzaBox May 2018 Spoiler + Free Bonus Box Coupon! SprezzaBox April 2018 FULL Spoilers + First Box for $10! SprezzaBox March 2018 FULL Spoilers + Coupon! SprezzaBox March 2018 Spoiler #1 + Coupon!